One for me, one for Dark Omen. Dark Omen is too practical to go to the midnight showing. I need to work on that boy. Jumping over the landmine seemed like a good idea at the time. *These are books from my bookshelf, shipped straight to the winners (US only). A copy of the new People magazine with Hunger Games. Open to winners in US and Canada only. 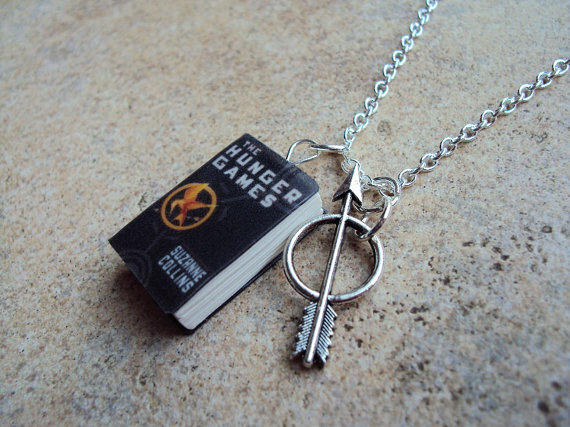 Hunger Games book charm necklace from etsy. 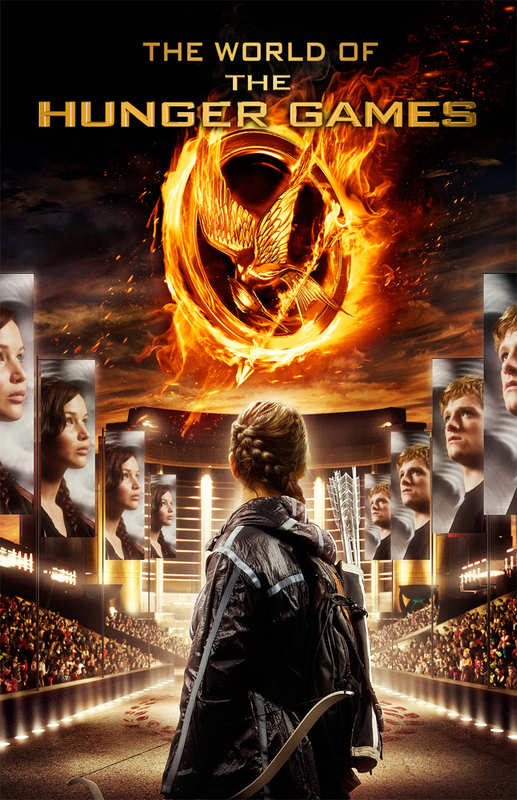 All this week I will be posting about Hunger Games: the phenomenon of a bestselling book, analyzing the novel, as well as the giveaway itself. 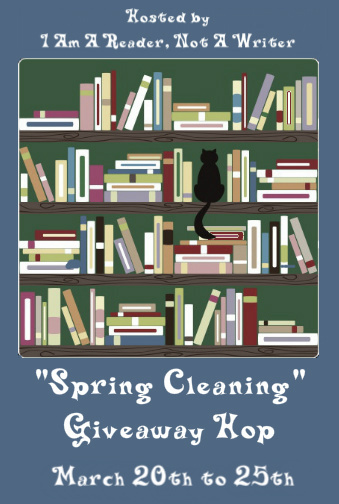 And you can find many other Spring Cleaning Giveaways by hopping through the linky below! « Coming Monday … Hunger Games Week! I was planning on seeing it with my daughter except she's going with her friends, so now I'm not so sure. But I'll see it eventually! Awesome giveaway. I'll let someone else win since we have these books. I'd dearly love to see this on the day it comes out, but I'm afraid I'll have to wait. I guarantee I'll see it, though…at some point in time. Great giveaway! I'm going to a swim meet all weekend so I'm not sure when I'll be able to see the movie, but hopefully soon. Fabulous giveaway! I can't wait to see this movie. Hi Susan–my daughter insisted I get tickets two weeks ago so we will be there Friday night at 7:10 with several of her friends and their moms. I'm really looking forward to it! I don't know if you can see on our tickets, but we have the 7:10 pm show too! I'm planning on arriving at least an hour ahead to get seats. Wow, terrific give away. You're right, who wouldn't want that charm? I can't wait to see the movie–hoping it's as good as the book. I can't wait.. I just hope they stay true to the story! Great giveaway! I'm not sure if we'll make it this weekend because of the 2 year old, but my teen daughter is going for sure. I am going Sunday with the Cali family. We can't wait. I hope they do the book justice. I still have not read this. The premise scares me. Kudos to the author though. CANNOT wait! My friends and I bought our tickets a week ago and are geared up and excited for the midnight showing. Woot! I can't wait!!! I couldn't convince my people to go to the midnight show either – it's like we're responsible adults or something. Whatevs! I've gotta find a shirt this week to wear when I see it on Saturday – I love yours. The books were so wonderful that I'm afraid to see the movie. Isn't that silly? What a great giveaway, Susan! The HG trilogy is amazing. This is so exciting! I really hope they pull it off! I am going to the midnight showing on Thursday night with my critique group. I hope this preggo can stay up that late haha. I'm sure the excitement will keep the adrenaline pumping! Frex yes! If I can get tickets in time, that is. Wish I was, but nope-won't be going to it this weekend. I will see it eventually though. AWESOME! 🙂 Cant wait to see the movie. Woot! I'm not sure when I'll be going to see the movie, but I hope it does the book justice : ) Thanks for the awesome giveaway!! Yay for The Hunger Games!! 🙂 what a great giveaway! Oops, in my excitement I forgot to answer the question. YES, definitely going to see the movie as soon as it comes out! No I don't have enough money to see the movie this weekend but i'm going to at some point! Thanks for the giveaway. Probably not, it will be crowded. Yes I will be going to the movies this week. I can't wait to see it!!! Not going have a chance to see it this weekend… Stupid work! I'm waiting to go see the movie because I want to be able to take my daughter. She's currently training at Ft. Irwin, CA and won't be back until the end of March. When she comes home on pass, we will all go. This was a favorite series of both her and my son, so we can't wait to see the movie! No! I wish though!!! I can't wait to see it! Hope you enjoy it and hope it is as awesome as the books! Thanks so much for the giveaway! Not this weekend, but I can't wait to see it! My plan is to see it. I hope that happens. I haven't read the books yet, so I am going to wait to see the movie until I do. I really want to! I think I might surprise my daughter with it, since her birthday is this weekend! My writer's group is planning an outing around the movie. So excited. I'm not watching the movie this weekend. Okay, so…even though death by bear isn't exactly death by natural causes, nature sure did do a number on you when the landmine's didn't work lol!! I doubt I'll be able to catch it this weekend but I hope to see it very soon. Thank you!! Can't wait for the movie!! I'm going Friday afternoon at 12:45! I can't stand crowds so the the midnight premier is out and so are the weekend night showings. But 12:45 should be PERFECT! I CANNOT WAIT!!!! And I just finished my re-read of book one. I'll be at the midnight showing with the BFF! And then doing the double date thing with the hubby and my cuz and her hubby the next day. Yes! I'm going on Friday night. I wanted to go Thurs. night, but I am in college and have a weekly class that I can't miss. I really, really want to, but doubt I will be able. I am torn. I liked the trailer, but not sure of the actors playing the main characters and this is giving me pause. But really would like to see how they handled this book on film 🙂 Thank you for the awesome giveaway opportunity. I actually hate crowds so I am waiting to see it when there are less people. I bought my tickets a week ago. 12:01! YAY! I plan on going Monday the 26th with my hubby! Can't wait to see it! Without a doubt!!! I cant wait tbh. I love the necklace! Good luck to all who entered! Im so excited to see this movie. Unfortunately, i dont think ill be able to go see it. Im gonna try though! I'm really hoping that I will get to see it. Btw I love the etsy necklace. OMG! I can't wait tomorrow I'll watch GMA from work. The countdown started for me last Friday when I purchased my tickets. AHHHH! I SO want that necklace!! My son has been harassing me to get midnight tickets. Luckily we live in a small town so I'm hoping they'll still have some available tomorrow. Of course I'm seeing it this weekend. I am actually going to wait out the weekend so as not to get completely trampled by people lol. Even though I'm sure plenty of people will see this movie more than once, I think the second time around won't be as crazy. I won't be seeing the movie this weekend — I don't like huge crowds. But I'll see it as soon as possible. My mom just recently read the series and she is as excited for the movie as I am! I'm not seeing the movie this weekend or probably at all until it is out on DVD I just purchased the Hunger Games book and I'm excited to finally read it! I will hopefully see it this weekend but if not I will see it by next weekend for sure!! I've read all of the books and I absolutely LOVE them! But I don't have the money to go see a movie in the theaters =( but I wish I was. Thanks for the awesome giveaway, though! Not going this weekend. I don't do well in crowds. I really hope I'm going to get to go this weekend, but if not, then definitely in the next week or so! Definitely going. Have the tickets! i'm going to the midnight premiere with a group of friends! we are having a water gun fight "hunger games" with a themed dinner before we go! so excited! I am most definitely going to the movie this Friday night! I am taking my husband and son (who haven't read the book, although son will soon, husband never will…) and daughter who has read it. I can't wait, and I would LOVE to win one of your prize packs! Thanks so much!! OMG! that is so awesome! I'm not a crowd person so I'll be waiting a little while. That necklace and the books are awesome! I already have the first book so Catching fire and MockingJay would be a great prize. May the Odds Be Ever in Your Favor Miss Étoile. Oh, and yes, I'm going to see the movie this weekend. This is a great giveaway. I was just thinking I needed to read the other books. I can't wait until the movie opens! Yes. I am seeing it with my daughter! I don't like crowds so I will not be going to the movies this weekend. I think i'll wait till the crowds die down. I am leaving work early and going to see the movie on Friday. I cant wait!!! I won't get a chance to go watch it, will probably have to wait til it's out on dvd! I loved the books though! I'm not really a fan of the casting, but I'm curious about how they portrayed the actual story/arena and what changes they made, so I'll definitely be checking out The Hunger Games film this weekend. I don't want to see the movies till I've read the books! Not this weekend, but soon! Thanks for the amazing giveaway! The necklace is AWESOME! Yes, I am going to see it!! I am so excited!! Nice job, Sue! You finally got me to join twitter. As for going to the movie? I think we can catch a late-night showing on Friday after the annual faculty appreciation dinner. Are you going to see the movie this weekend? I'm going to try my best to go see it! Yes, I'm going to see the movie tomorrow. 😀 Thank you for this giveaway! No i will probably see the movie when it comes out on HBO. Thanks for the giveaway. Yeah but not on opening night. I would love to watch it this week, especially because it will be spring break and I won't have to worry about school. But I may just wait a while before I watch it. If I could I would go see it tonight at the midnight premier. No, not this weekend. My son wants to see it for his birthday which is April 1st. Of course! Already have tickets for Saturday night! I would love to but am going to be on the road! I am going on Wednesday! My local theater has family night on Wednesday you get a movie ticket pop corn and soda for 7 dollars!! Its killing me to wait that long though! i saw it last night at midnight. I'm sure i'll see it again too, because my dad really wants to go. Awesome film! I am going to get in line in 2 hours to see it. Yay! I just got back from seeing it and freaking LOVED it!!!!! No, I'm not going to see it yet. I think I'll read the book first and wait for the DVD. I wish! But no, I'm going to wait, the movies are so expensive. I wish I could see the movie now, but I want to read the book first and it should arrive any day (I can hardly wait!). I just saw the movie yesterday evening with a couple of friends! I had reservations abou tthe actors, but I have to say, I am definitely impressed. No, but I will see it soon. We're not going this weekend, but we'll be going next week or the following week. We're waiting for the crowds to die down much to my 11-year-old's chagrin 🙂 Thanks for the giveaway! I just saw it today!! And it was amazing =) I loved Jen Lawrence in Winter's Bone and loved her just as much in Hunger Games. Nope, I quit going to movie theaters years ago. Unfortunately not this weekend because this pay check is being used for student loans and because I'm going to a concert… maybe next week or the week afterwards?! I saw it at midnight as well as later on Friday! It was fantastic both times!! I won't, but a couple of my grandchildren are going. I am seeing it next week! Can't wait! Saw it at midnight! It was amazing! Thanks for the giveaway! I don't have the 2nd or 3rd books yet! I went to the midnight premiere and saw it again on Saturday. Went to the midnight premiere! Going again this week! Yep, I already saw it on Friday. It was good.